Flower Hill School Principal Lucia Laguarda with the student award recipients. There was plenty of electricity around the school when Flower Hill’s March’s Star Student Awards were announced. 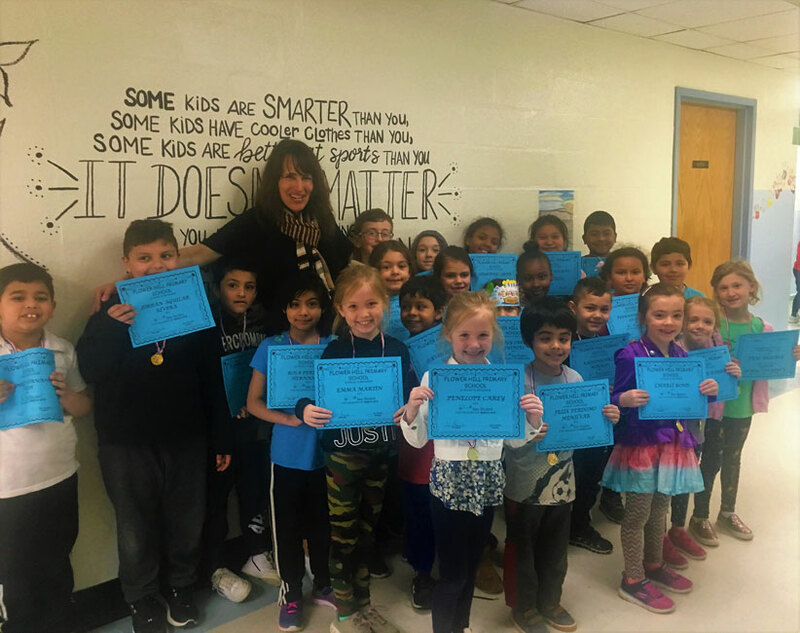 Ms. Laguarda presented the youngsters with certificates and then took a photo with them to commemorate the occasion. The outstanding students were honored for their classroom work and efforts throughout the school, both indoors and on the playground and even on the bus ride to and from the building each day. The youngster’s collaboration with teachers and fellow students really stood out in s sensational way. Third grade teacher Veronica Quinlan’s entire class was also honored for their exceptional performance during March. Flower Hill Primary School has established a well-deserved reputation in the community for emphasizing academic excellence and social growth. Opened in September 1954, the school today houses students ranging from kindergarten through third grade. Flower Hill School is committed to helping its students achieve their full academic potential and to supporting the development of social skills that will help each child successfully navigate through the school setting during their formative years. To this end, Flower Hill’s goal is to consistently provide a learning environment that fosters the intellectual, emotional, social and physical development of each student. Flower Hill’s staff of caring professionals offers a child-centered educational program in a supportive and nurturing environment. It is hoped that by providing teaching that inspires, informs and challenges, teachers and support staff can instill a love for learning that will continue throughout each child’s school years and beyond. In addition to the rich regular day classroom program, each child receives instruction in art, music, physical education, library skills and technology from faculty who are specialists in each of these areas. Flower Hill also has a school nurse, psychologist, social worker, reading and math specialists and other professional staff members who provide critical support to students. A strong partnership between students, parents and teachers is very important to daily life at Flower Hill. Principal Lucia Laguarda and all teachers and staff members are confident that by working together to build a positive collaboration between home and school, Flower Hill will continue to provide quality educational experiences for all of its students.